Image pre-processing is essential to quantitative image analysis. Denoising. Intensity noise reduction in regions of uniform intensity profile is offered through a low-level image processing method, namely Smallest Univalue Segment Assimilating Nucleus (SUSAN) . This is a custom implementation and does NOT call out to the original implementation distributed by FSL. Co-registration. Registration of various images to the same anatomical template, for examining anatomically aligned imaging signals in tandem and at the voxel level, is done using the Greedy Registration algorithm . Bias correction. Correction for magnetic field inhomogeneity is provided using a non-parametric non-uniform intensity normalization . Intensity normalization. Conversion of signals across modalities to comparable quantities using histogram matching . DeepMedic normalization. 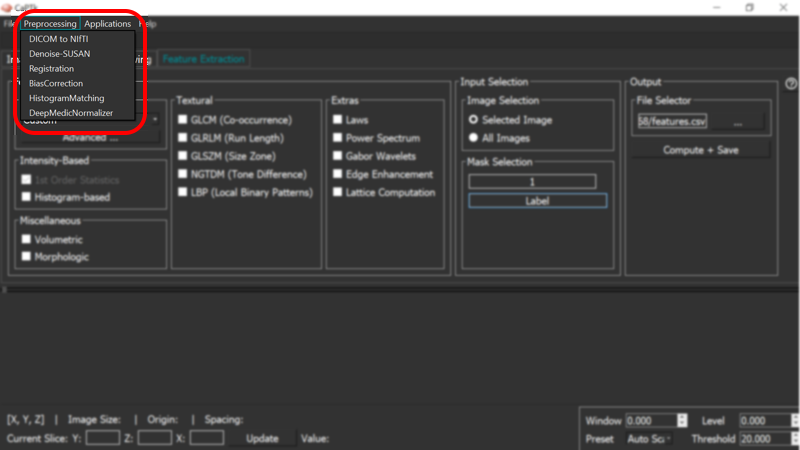 Images are normalized using a z-scoring mechanism with option to do the normalization within the region of interest or across the entire image. In addition, there is an option to remove outliers & noise from the image by removing a certain percentage of the top and bottom intensity ranges . S.Bauer, L.P.Nolte, M.Reyes, "Skull-stripping for Tumor-bearing Brain Images", arXiv. abs/1204.0357, 2012.